Ever since The Wire and Battlestar Galactica finished, I’ve been looking for an episodic drama that is more than your terrorist-chasing, baddie-bagging, clock-ticking thrill ride. Dexter was OK, House is too convoluted, Lost just got boring and the British dramas simply cannot compete at the moment (although Luther, I here, is generating some interest beyond these shores). Then stepped in Charlie Brooker with a suggestion, ‘Breaking Bad‘, by Vince Gilligan. I find it difficult to disagree with anything Mr. Brooker says at the moment, and after all, he was the one that alerted Britain to The Wire years before it was fashionable. So I decided it was worth a try. How right he was. NB: I will be discussing the series in some detail, and there are some spoilers, but don’t let that put you off. Breaking Bad is essentially the story of Walter White, a middle-aged high school chemistry teacher who at the very beginning of the pilot episode, is diagnosed with terminal cancer. Then begins his downward trajectory to seeming madness, eventually getting involved with an ex-student, turned junkie, using his advanced chemistry knowledge to ‘cook’ crystal meth. The entire 3 series to date then chronicle his involvement with the drug trade, juxtaposed with his desire to maintain a normal family life. The surrounding characters (his junkie partner, his wife, his brother-in-law in the DEA) also begin to ‘break bad’, and basically, everyone is constantly battling personal demons, lying, trying to survive drug turf wars and generally surviving. The prevailing winds of the show then are Walter’s erected edifice around his criminal life that systematically comes crumbling down, harming himself and those around him. His emotional justifications for his actions, coupled with the lies he tells to his family and friends serve to create a wall of (in)security around him, and what the writers, cinematographers and directors do so artfully and intriguingly, is to show us how intricately Walter tries to ‘plug’ the gaps in this wall, and how he copes with that inevitable failure. Zizek wrote; “our most elementary experience of subjectivity is that of the ‘richness of my inner life’: this is what I ‘really am’, in contrast to the symbolic determinations and mandates I assume in public life…. The first lesson of psychoanalysis here is that this ‘richness of our inner life’ is fundamentally fake: a screen, a false distance, whose function is, as it were, to save my appearance, to render palpable (accessible to my imaginary narcissism) my true social-symbolic identity” (Zizek, 2008: 12). Playing on the Lacanian Imaginary – Symbolic – Real triumvirate, Zizek goes on to suggest that the ‘public masks’ people put on to disguise their ‘real self’ is something which of ‘itself’, becomes a truism, but a varied one. This is highly evident within ‘Breaking Bad’, as Walter’s battle to keep the Real separated from everyone else consumes him and you start to see the blurring of one with the other in varied and multiple ways. There are numerous examples of this, not least his new found (we assume it is new found anyway) desire for sexual extravagance with his wife. The murder of the captive drug dealer in the basement is also a telling scene – where initially he is reluctant and convinces himself to let the captive free, but when he realises the captive’s plan to kill him, he then improvises a murder. While perhaps designed to think it was in self-defence, the continued journey of Walter into the organised criminal world suggests that it was the first signifier of a dissolution of the ‘mask of the real’. In the recently concluded series 3, his wife becomes aware of his ‘cooking’ and of course, as any respectful citizen should do, she recoils in horror, demanding divorce and a complete defenestration of Walter from the family life. But as the series progresses, she too begins to show that the Real cannot be masked, and her ‘true self’ (as Zizek would puport anyway) comes to fore in the form of, what is essentially, pure greed (although this is initially directed as a need to support her brother-in-law’s recent expensive physiotherapy sessions caused, in directly, by Walter’s involvement in illegal drug production). And so, as Walter’s actions begin to infect everyone around him, so to is the bifurcation, and then eventual blurring of the Real from publicly-serving Imaginary. What was once thought of as initially ‘real’ (wholesome family life), then is shown to be a simulacrum of a seedier, truer reality. So far, his children remain encamped in the first instance of reality, but my inkling would be that not even they remain immune from the contamination of Walter’s reality. 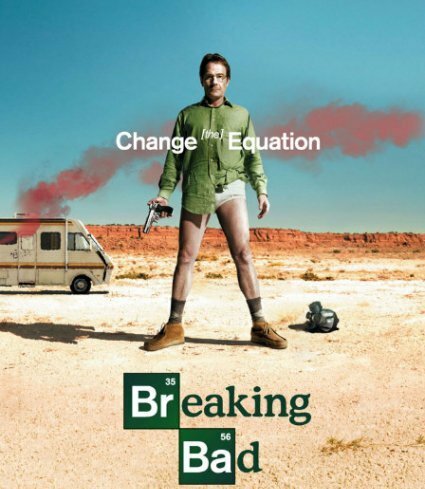 Vince Gilligan, the creator of Breaking Bad insists that the show will have an ending, rather than a continual, ongoing story that reaches absurdity and repetition, at the behest of the Hollywood bean counters. This being the case, we can surmise that the eventual conclusion of Walter will be death, but not due to his terminal cancer (which is currently in remission), but through the ongoing cataclysm of the Real and his attempts to stop it from surfacing not only to those around him, but to himself. I for one, cannot wait to find out. Categories: Battlestar Galactica, Charlie Brooker, The Wire, TV Review | Tags: Breaking Bad, TV Review | Permalink. Fantastic show :-) nice review.